I write a lot of posts to educate, encourage, and inspire the wonderful woman that read the Gaia Magick blog. Today, however, I thought I’d write a post just to entertain you. We all need a little more fun and laughter in our lives, so sit back and enjoy a treat for your funny bone. This woman can surely accomplish some great feats in 3 minutes! I can not get in and out of the shower in 3 minutes-that is one Super Mom! get a client tied into a corset…not as easy as it looks! What can you do in three minutes? Leave me a list in the comments! So much can change and be accomplished in 3 months, if I was to write a list for three years this blog post would never end! If you have had something either amazing or not so great take three years of your life, leave me a comment on what it was and the final out come. You can check out this spring closet cleaning video for the top three things to remove from your wardrobe this spring. Also, 3 things to add to your slimmed down closet. I’m sorry, I’ll never be able to let go of the excessive sparkle, or the shoes! Well, maybe the pairs that are supper uncomfortable because they actually don’t fit me… maybe! Check out this Wiki-how for three ways to Take You Mind off Things. This article has three broad categories which list many really good suggestions for de-stressing. Feeling like you need a little boost? Going through a bit of a rough patch in your life? How about the lyrics to Jason Mraz’s song Three Things? Look here for the lyrics, while you watch the video and sing along here! Now that you’ve been lost in cyber space for 3 minutes or 3 hours, you can get back to your regular life. Don’t forget the Name Your Own Price sessions are still on, go here for more info. 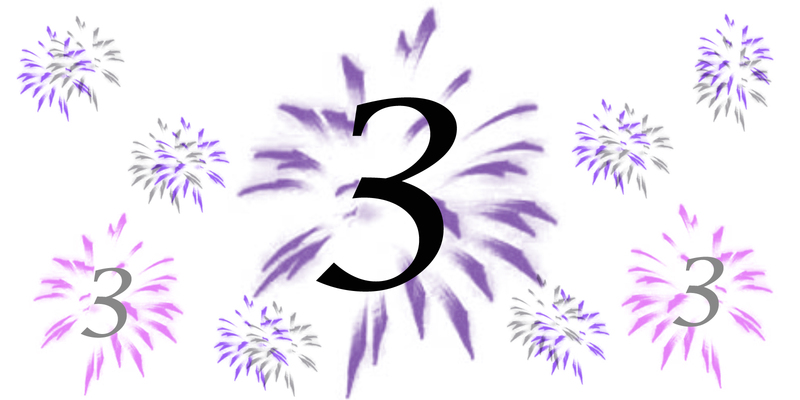 Also, we are celebrating Gaia Magick’s Third year of helping woman of all shapes, ages, and personalities feel amazing by offering you three fabulous specials, check them out here. Do you need a little more information or perhaps, help coming up with a creative inspiration that truly brings out your inner goddess, please contact me right now. I’d love to chat with you!